Feliciano, center, with Luke and me. Seven of our eleven pilgrims opted to walk the whole distance. Left to right: Lisa, Mary, Mike, Mary Ann, Denise, Fiona, Millie. Views to the Sacred Valley. Photo op at the wooden cross above the St Francis Beech Tree. Walking down from the heights. Results of recent forest fires near Poggio Bustone. Our nervous group encounters a nervous cow. On GPS this is what my day looks like. The red line is our intended track as we arrive in Poggio Bustone. Blue is my actual recorded track at our arrival. Our intended distance for the day was 21 km. Actual distance today was 31+. Italian Hospitality? Molto Gentile. Italian Weather? Rain! Today’s weather report called for rain all morning, then sun in the afternoon. 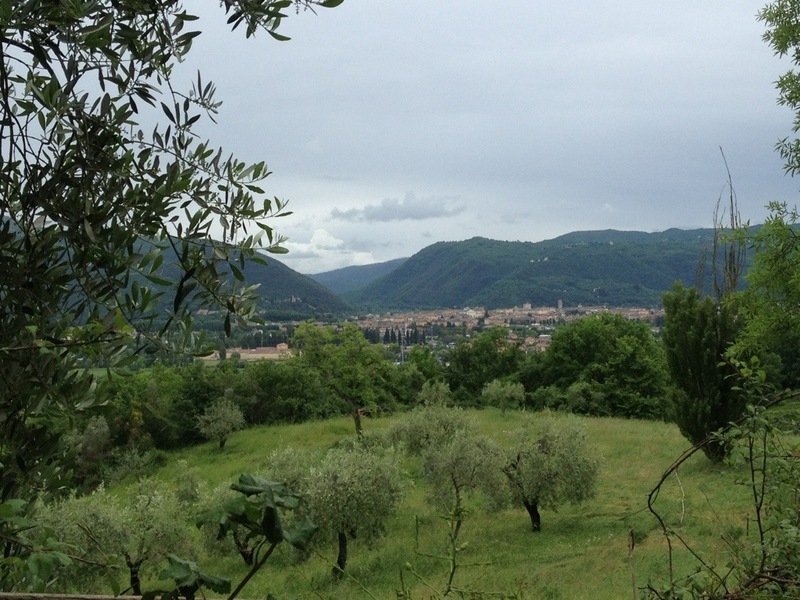 This grim forecast convinced our group to hang out in Poggio and hope for a dry 15 km (10 mile) walk after the rain was done. We waited in the “yoga room” of our hostel, La Locanda Francescana, which gave us time for good byes with Michelle, our hostess. Last night we enjoyed the cooking of her partner, Feliciano, at the hostel’s restaurant, and once again, as at Piediluco, we were overwhelmed by the generous hospitality of the local Italians. Before cooking our meal Feliciano graciously asked for dietary issues within our group. I explained that I don’t eat red meat (a staple of all Italian second courses, it seems) and he kindly secured some “local chicken” for last night’s dinner. It was the first meat of any kind I’ve eaten in several days. On our way out this morning he shared the tender, Italian two-cheek kiss with each of us. The result with his day’s growth of beard was kind and scratchy-sweet. We left with a smile and a promise to come back. Before beginning our walk at a disappointingly rainy noon hour we had a bite of lunch next to an intense card game at a bar off the main piazza. 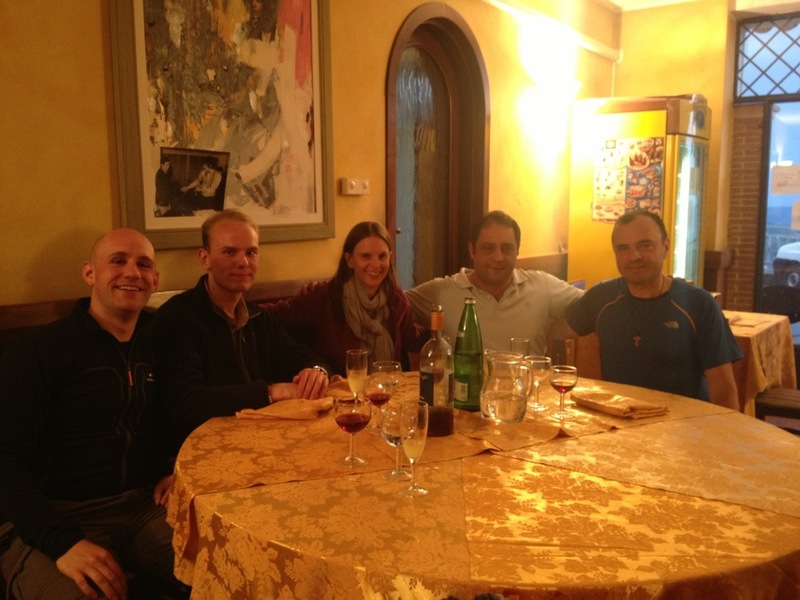 Jacqueline was not feeling well and had decided to take the bus to Rieti, so Sebastian, Andreas and I walked down and out of Poggio Bustone in the cold precipitation decked out in rain gear and hoping for the best. 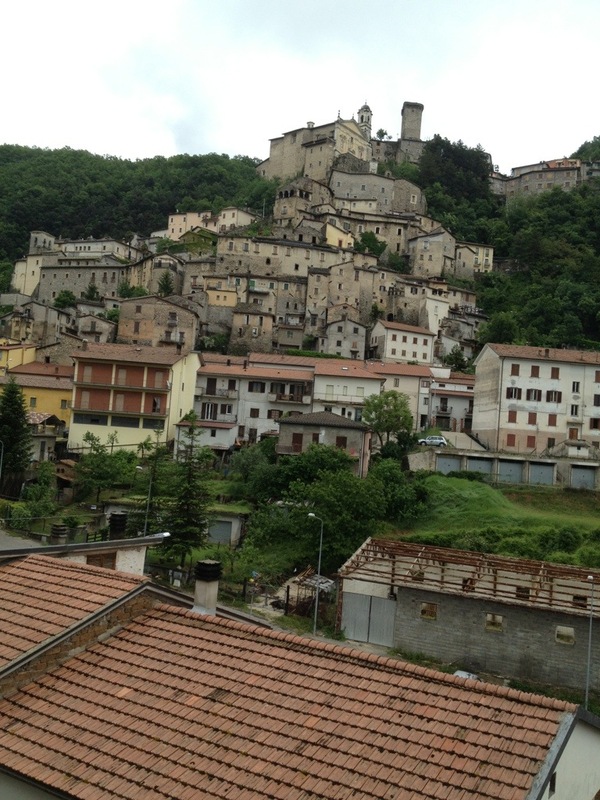 Before reaching the bottom of this lofty hill town we had already lost the waymarks, so we headed onto the shoulderless car road to Rieti, which we daringly followed as far as the turnoff to Cantalice. Here an Italian woman in a grey car spotted us looking at our maps and pulled over to give us directions. 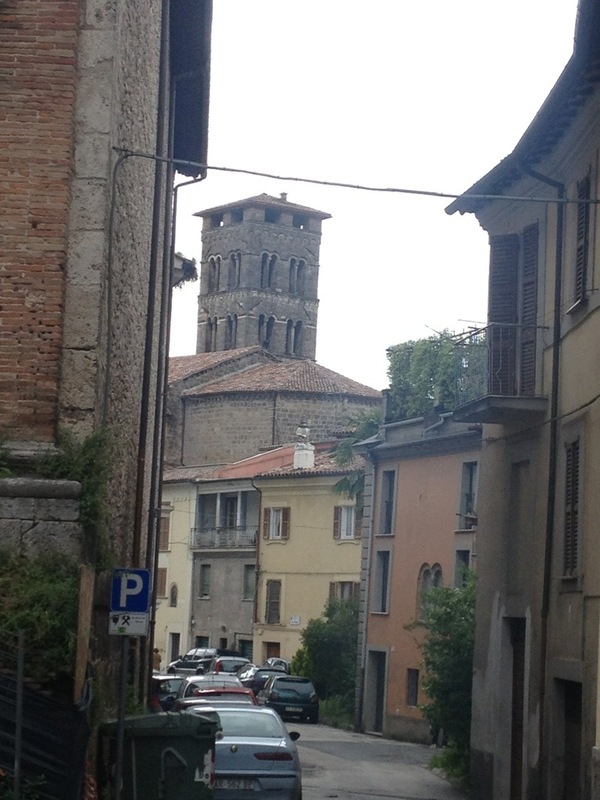 Her suggestion was to follow a quiet auto road into Cantalice, rather than take the more direct but busier auto road straight to Rieti. Her advice was wise, but in the one dangerous moment of our walk we met a truck coming uphill on a narrow turn with a bus (Jacqueline’s, it turned out) coming downhill at he same spot. Andreas happened to be on the cliff side of the road while Sebastian and I were on the rock wall side. Traffic stopped in both directions while pilgrims and motor traffic took turns using the narrow road. As the bus passed we waved to Jacqueline and other pilgrims aboard who’d noticed us stopping traffic. We were happy to see Jacqueline, even if it was just with a quick wave from the side of the road. 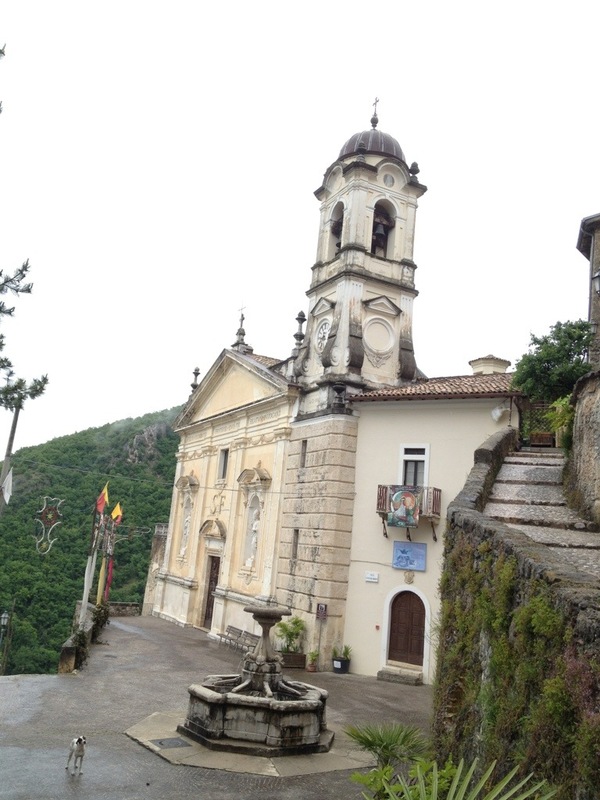 The rain and traffic soon subsided and we had our first good look at Cantalice, another Italian hill town, this one seemingly even steeper than each of the others. Our first thought should have been, “How beautiful!” but was actually, “Hope we don’t have to climb that!” We’d been without waymarks since we left Poggio and were delighted and disappointed to find them again at the foot of a steep staircase — this time pointing straight up the steep city streets. We stopped for pictures of decaying doorways and ancient church facades in this mouldering town, then were given helpful directions by a Brit who’d heard sounds of English emanating from the path below. “Follow the road past the bar and keep going!” It worked, and soon we were heading along a ridge at the same level as upper Cantalice, enjoying views back to the town and, when the clouds cleared, as far as Poggio Bustone. The ridge continued in a southeasterly direction, pushing us closer to La Foresta, our final St Francis site of this pilgrimage. We arrived there at about 4:00, finding an empty chapel and shuttered cloisters. That allowed a quick visit and we covered the remainder of the walk to Reiti in a brisk, 40 minute downhill march. The outskirts of even the prettiest towns seem to be a maze of parking lots and strip malls, Reiti being no exception. But after passing through the gate of the city’s medieval walls we were in another world. The quiet streets were filled with workers heading home, grandmothers on errands, Italian soldiers in uniform fatigues chatting by fountains and cheerful teenagers enjoying dripping cones of colorful gelato. Jacqueline, who’d arrived hours before, had found a room for herself and a triple room for us. We settled in, showered, dressed in clean clothes, and headed out with Jacqueline among us again, this time to enjoy the now dry and sunny weather as well as the sights and sounds of a beautiful, Italian town. The evening’s meal was filled with good food, wine and laughter, plus the hospitality of a kind restaurant proprietor who opened his establishment 15 minutes early to accommodate a few tired and hungry pilgrims who had just finished their rainy day’s journey by foot or bus.